Wrangler is looking for his forever home. If you think it could be yours, read more about Adopting from BDRA before submitting your application below. BDRA relies on your donations to rescue blind dogs around the United States. Please consider giving in support of Wrangler. In February 2016, Wrangler was brought into a shelter in Texas by his owners who no longer wanted him. He was dirty, covered with fleas, had kennel cough, worms, and a cataract. He also was heartworm positive. Luckily, he was spotted by the Blind Dog Rescue Alliance (BDRA) and his life was saved! 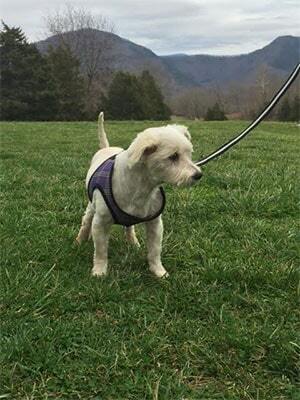 He was pulled from the shelter and spent a few weeks in Texas with a great temporary foster mom, and then traveled to Virginia to his BDRA foster home in early March 2016. Wrangler has been in his Virginia foster home for two weeks so far, and he is settling in well! He was thoroughly checked out at the vet clinic, and has begun his heartworm treatment. Treating heartworm takes several months. The guidelines from the American Heartworm Society are being followed. The great news is Wrangler hardly coughs now, and his appetite and energy are very good. 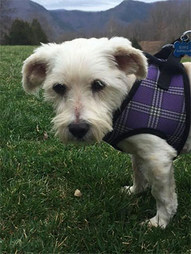 Wrangler does not hear much although will react to loud sounds, and he sees fairly well in spite of his cataract. He gets around the house and yard well. He is in need of a dental but this cannot be completed until the heartworm treatment is much further along. His weight is good (18 pounds) and his heart and lungs are in good shape, too, in spite of the heartworms. The vet said his heart is mildly enlarged (but not bad at all) and this does happen when a dog has heartworms. Wrangler gets along with people, dogs, and cats! He enjoys attention and often sleeps at the feet of his foster parents. He is housetrained and leash trained. He likes walks, but walking is restricted right now while he is undergoing his heartworm treatment. He loves to eat. He sleeps quietly through the night. Wrangler hasn’t shared exactly what kind of dog he is. Some say Poodle, some say Maltese, but he looks mostly like a Westie (West Highland Terrier). Although there could be something else there too! Wrangler has settled into his BDRA foster home for now so he can get rid of all those heartworms, but he will be available for adoption soon, and he is hoping someone out there would want him for their very own! Please check out Wrangler’s blog (link on this page). Wrangler will be posting updates on an ongoing basis about his HW treatment and he will also be sharing photos about life at his foster home.